What Makes an F1 Driver? Way back in the sixties, I remember reading of a study that set out to establish what was different about F1 drivers. It seems that, in spite of subjecting the drivers to every test they could think of, the scientists could find only one aspect that marked out F1 drivers from ordinary mortals - they blinked far fewer times per minute than we do. That might stand to reason, implying as it does that F1 drivers need to keep their eyes open and concentrating when things around them are happening at so great a speed. But I'm not sure that we could turn the matter around and select drivers only from those few of the population who have an abnormally slow blink rate. There might be those who would deliberately stop blinking in order to be amongst the chosen! What it means, of course, is that there is no way to look at a guy and judge him as F1 material. The sport's heroes differ enormously in approach, character and motivation, they just blink less. We could suggest qualities that we expect in a driver but even then we run into difficulties with defining what we mean by a quality. Take courage, for example. Stories abound about Nigel Mansell's bravery, my favorite being one of his earliest races for the Lotus team. I forget which race it was but the fuel tank leaked and Nigel found himself sitting in a seat soaked in gasoline. The fuel ate away at the skin on his back agonizingly but our Nige continued and finished the race. But what of the sort of courage displayed by the little-regarded Andrea de Cesaris? There is no doubt that he was way out of his depth in F1 and team members would talk of how he would emerge from a hot qualifying lap white-faced and trembling, he had scared himself so much. Surely that is incredible courage, that he could push himself to compete for year after year. He had money, as is so often pointed out, and did not need to race for his living. The urge to compete is another quality often mentioned and there is surely no finer example than Gilles Villeneuve. He would race anything that moved and spent most of his career hauling ill-handling cars far higher up the grid than they deserved to be. Yet is such determination any more to be valued than the cold, calculating skill of a Prost who waits until circumstances turn his way before giving of his best? And what of the drivers whose hopes of being champion have died? What is the motivation behind the long careers of drivers like Riccardo Patrese and David Coulthard, employed for their experience and consistency rather than through any thought that they would suddenly break through and win races again? They are a mixed bunch, F1 drivers, probably just as diverse as the rest of the population. From the cigarette smoking, outspoken Keke Rosberg to the finely-tuned, ultra-fit machine that was Michael Schumacher, from the nice guys like Rubens Barrichello to the glowering Jean Alesi, from the jokers like Johnny Herbert to the monosyllabic Kimi Raikkonen, all human life is represented in the paddock of F1. All that we can say of them is that they all know how to throw a car around a track pretty quickly. Perhaps that is enough and it is good that there is no answer to the question posed by the title of this post. We can never define the requirements for driving an F1 car and it remains an enigma as to why some succeed and others do not. I think you may have forgotten the all important factor of luck. If 90% of success is just showing up, the other 10% is luck. Good and bad days are what happen when you are there; success and advancement rely on being there when the opportunity arrives. 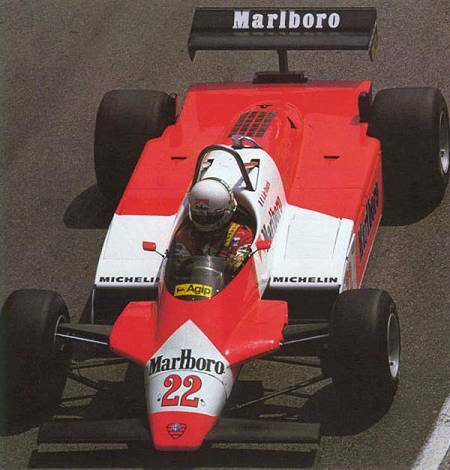 There are countless deserving drivers who have tried to enter the ranks of F1 but never got the chance because lady luck was looking elsewhere. I am also sure that there are stories of drivers who could have gone to F1 but missed their chance because they failed to be in the right place when they needed to be. David Coulthard strikes me as a person who always shows up and does the job. I am sure I have seen some of his good and bad days. Mark Weber is another who always shows up for the roll call (even when he has a stomach virus). I don't mean to take away from the skill or courage or stamina that any of these guys must have in order to do what they do. My point is that beyond not blinking, these guys always show up to do the job, and all share a bit of what lady luck has doled out. Some got more of what she was offering (Nelson Piquet Jr. vs Mark Weber), but I think it takes more luck to get the opportunity to run at the back of the pack in F1 than the luck it takes to be successful at business, to have a good marriage or to race carts on the weekend. Mansell's fuel incident was on his debut in F1 at the Oesterreichring. Insane as it sounds now team routinely topped up fuel on the grid. This was done by sticking a funnel in the top of the fuel tank where the role hoop is. A mechanic then lifted and poured the fuel into the funnel often as in this case with the driver in situ. In this case they over-filled the tank and the excess ran down Mansell's back. With no time to resolve the problem before the start Mansell elected to race with his back suffering from chemical and friction burns as he moved around in his seat. In the end he retired after 40 of the 54 laps due to an engine problem. Mansell's drama queen antics later in his career used to wind me up because he was incredibly brave having survived incidents like this and a broken neck in Formula Ford. Marc: Quite right - I should have mentioned luck as being a valuable commodity to an F1 driver. I have written before about the influence of luck in a driver's career and I think that, in some cases, it can be the difference between a driver becoming champion and never making it. As for showing up, Raikkonen has demonstrated for us lately what happens when a driver doesn't bother to. That seems fairly rare, however, and is probably the result of Kimi's withdrawn personality. Steven: Thanks for supplying the extra detail on Mansell; my memory is not what it once was, I'm afraid! But you remind me that there was a time when I actually liked Mansell (and it probably had a lot to do with that fuel incident). Over the years he gradually alienated me with his overinflated view of his own talents and constant excuses. By the time he broke through to become champion, I couldn't stand the guy! Really? Mansell broke his neck? To recover from that is impressive. To then continue with a motorsport career is even more so. I can't remember the full story but he had a mega Formula Ford season winning something like 32 out of 40 races and near the end of the season he had an accident that resulted in a broken neck. He was told that it would mean months without moving and he would probably never drive again. He was also told that if he did not spend months immobile there was a risk that he would be paralysed from the neck down. He signed himself out of hospital and went straight back to racing. Fortunately he only suffered paralysis from the neck up. Clive, Sorry to respond to this so late, but I though I would share this with you. I don't know if you have seen it or not, but there is a Documentary Called "Speed" made my Jeremy Clarkson. in the second part of the documentary, he talks about the characteristics of F1 driver's. He interviewed Schumacher, it turned out that F1 drivers are hard to get excited. In addition, there are very good at multitasking. By the way, I really admire your insights, and I am a long time silent reader for your blog. Thank you, Moe - it is always good to be appreciated. Interesting point about the cool heads of F1 drivers - one can see how that would serve them well in the thick of a race. Multitasking, of course, must be absolutely necessary with modern steering wheels, littered with buttons as they are! He blinks really, really rarely lol.